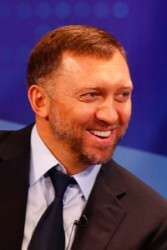 The Russian industrialist Oleg Deripaska buys 0.6% of Strabag shares. In total, he holds a stake of 18.2%. Deripaska enlarges his stake in Strabag gradually. This week, he has acquired two tranches with a size of 0.3% each. The seller was the private trust of CEO Hans-Peter Haselsteiner. Deripaska and Haselsteiner´s trust agreed on a share price of € 19.25. Deripaska has the option to buy another 8.0%. This article includes a total of 91 words.